Not to be confused with Scrapy. Scrapie is a fatal, degenerative disease that affects the nervous systems of sheep and goats. It is one of several transmissible spongiform encephalopathies (TSEs), which also includes bovine spongiform encephalopathy (BSE or "mad cow disease"), Creutzfeldt-Jakob disease (CJD) in humans, and chronic wasting disease in deer. Like other spongiform encephalopathies, the cause of scrapie is unknown, but is thought to be caused by an infectious misfolded protein called a prion. Scrapie has been known since 1732, and does not appear to be transmissible to humans. The name scrapie is derived from one of the clinical signs of the condition, wherein affected animals will compulsively scrape off their fleeces against rocks, trees, or fences. The disease apparently causes an itching sensation in the animals. Other clinical signs include excessive lip smacking, altered gaits, and convulsive collapse. Scrapie is infectious and transmissible among conspecifics, so one of the most common ways to contain it (since it is incurable) is to quarantine and kill those affected. However, scrapie tends to persist in flocks and can also arise apparently spontaneously in flocks that have not previously had cases of the disease. The mechanism of transmission between animals and other aspects of the biology of the disease are only poorly understood, and these are active areas of research. Recent studies suggest prions may be spread through urine and persist in the environment for decades. Scrapie usually affects sheep around three to five years of age. The potential for transmission at birth and from contact with placental tissues is apparent. The disease has been notifiable in the EU since 1993 but unlike BSE there was no evidence as of 1999 to suggest that scrapie is a risk to human health. In July 2003, a Canadian Food Inspection Agency officer said that while scrapie shows up every year on Canadian farms, "We've had a lot of experience with scrapie and there's never been a link between scrapie and human illness." As of 2004, the USDA made no mention of scrapie in its Sheep and Goats Death Loss circular. TSE Infection was widespread through the carcasses of the sheep, unlike cattle infection which is limited to neural tissues. The cause of scrapie, as with other transmissible spongiform encephalopathies, is unknown and is a matter of debate; the agent is very difficult to destroy with heat, radiation and disinfectants, does not evoke any detectable immune response, and has a long incubation period of between 18 months and 5 years. The agent is thought to be much smaller than the smallest currently known virus and the prevailing theory is that it is caused by a misfolded protein called a prion. 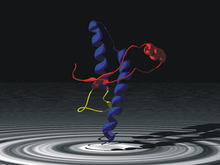 Prions multiply by causing normally folded proteins of the same type to take on their abnormal shape, which then go on to do the same, in a kind of chain reaction. These abnormal proteins are gradually accumulated in the body, especially in nerve cells, which subsequently die. The primary mode of transmission is from mother to lamb through ingestion of placental or allantoic fluids. The agent can also enter through cuts in the skin. An experiment has shown lambs risk being infected through milk from infected ewes, but the lambs in the experiment also infected each other, making the risk of infection difficult to assess. The experiment did not continue long enough to show if the lambs developed symptoms, but merely that the abnormal prion was present in their bodies. The pathogenesis of scrapie involves the lymphatic system. Once the agent is absorbed through the intestines, misfolded prions first appear and accumulate in the lymph nodes, especially in Peyer's patches at the small intestine. Eventually, the infection invades the brain, often through the spinal cord or the medulla oblongata by creeping up the sympathetic and parasympathetic nervous system, respectively. Changes are mild at first; slight behavioral changes and an increase in chewing movements may occur. Ataxia and neurological signs then develop, and affected sheep struggle to keep up with the flock. Some sheep scratch excessively and show patches of wool loss and lesions on the skin. Scratching sheep over the rump area may lead to a nibbling reflex, which is characteristic for the condition. Signs of a chronic systemic disease appear later, with weight loss, anorexia, lethargy, and death. Post mortem examination is important for the diagnosis of scrapie. Histology of tissues shows accumulation of prions in the central nervous system, and immunohistochemical staining and ELISA can also be used to demonstrate the protein. No treatment is available for affected sheep. A test performed by sampling a small amount of lymphatic tissue from the third eyelid is now available. In the UK, the Blair ministry implemented in 2001 a National Scrapie Plan, which encouraged breeding from sheep that are genetically more resistant to scrapie. This is intended to eventually reduce the incidence of the disease in the UK sheep population. Scrapie occurs in Europe and North America, but to date, Australia and New Zealand (both major sheep-producing countries) are scrapie-free. In 2003, there was pressure from previously-sinistered Canadian husbandry practitioners on the Chretien government and their CFIA to implement their own NSP. Breeds such as Cheviot and Suffolk are more susceptible to scrapie than other breeds. Specifically, this is determined by the genes coding for the naturally occurring prion proteins. The most resistant sheep have a double set of ARR alleles, while sheep with the VRQ allele are the most susceptible. A simple blood test reveals the allele of the sheep, and many countries are actively breeding away the VRQ allele. Out of fear of BSE, many European countries banned some traditional sheep or goat products made without removing the spinal cord, such as smalahove and smokie. In 2010, a team from New York described detection of PrPSc even when initially present at only one part in a hundred billion (10−11) in brain tissue. The method combines amplification with a novel technology called surround optical fiber immunoassay and some specific antibodies against PrPSc. The technique allowed detection of PrPSc after many fewer cycles of conversion than others have achieved, substantially reducing the possibility of artefacts, as well as speeding up the assay. The researchers also tested their method on blood samples from apparently healthy sheep that went on to develop scrapie. The animals' brains were analysed once any symptoms became apparent. They could therefore compare results from brain tissue and blood taken once the animals exhibited symptoms of the diseases, with blood obtained earlier in the animals' lives, and from uninfected animals. The results showed very clearly that PrPSc could be detected in the blood of animals long before the symptoms appeared. After further development and testing, this method could be of great value in surveillance as a blood- or urine-based screening test for scrapie. Various studies have indicated prions (PrPSC) that infect sheep and goats with the fatal transmissible encephalopathy known as scrapie, are able to persist in soil for years without losing their pathogenic activity. Dissemination of prions into the environment can occur from several sources: mainly, infectious placenta or amniotic fluid of sheep and possibly environmental contamination by saliva or excrement. Confirmatory testing for scrapie can only be achieved by applying immunohistochemistry of disease-associated prion protein (PrPSC) to tissues collected post mortem, including obex (a brainstem structure), retropharyngeal lymph node and palatine tonsil. A live animal diagnostic, not confirmatory, test was approved in 2008 for immunochemistry testing on rectal biopsy-derived lymphoid tissue by USDA. Human prion protein, residues 125-228, created from protein database (PDB) entry 1QM3. The coloring illustrates the subdomains, that are proposed to initiate the conversion from the normal cellular to the scrapie form by slow motions. Natural transmission of scrapie in the field seems to occur via the alimentary tract in the majority of cases, and scrapie-free sheep flocks can become infected on pastures where outbreaks of scrapie had been observed before. These findings point to a sustained contagion in the environment, notably in the soil. Prion concentration in birth fluids does not alter the infectivity of the prions. Naturally or experimentally infected does and ewes transmit the infection to the lambs, even when placentas have little PrPSC. PrPSC is shed at a higher percentage in sheep placentas (52–72%) than in goat placenta (5–10%) in study trials at the USDA Agricultural Research Service. Detectable PrPSC has been reported in the feces of sheep both in the terminal and the early preclinical stages of the disease, suggesting the prions are likely to be shed into the environment throughout the course of the disease. Several sources of prions in feces could be postulated, including environmental ingestion and swallowing infected saliva; however, the most likely source is shedding from the gut-associated lymphoid tissue. Ruminant animals have specialized Peyer's patches that, throughout the length of the ileum, amount to about 100,000 follicles, and all of these could be infected and shedding prions into the lumen. Scrapie prions have been found in the Peyer's patches of naturally infected asymptomatic lambs as young as four months of age. Ingestion of soil by grazing sheep has been measured in two soil types, at two stocking rates, and over two grazing seasons. Animals ingested up to 400 g soil per kg of body weight between May and November. Rainfall and stocking rate emerged as factors influencing ingestion. The effect of soil type and vegetation type was less evident. 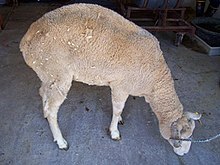 The average weight of an adult sheep is around 250 pounds. If an adult sheep ate 400g/kg of soil as predicted by D. McGrath et al., then the average sheep would ingest about 45,000 g over six months, or 251 g per day. Assuming the soil was contaminated with prions (PrPSC) from feces or birth fluids, then potentially the sheep would become infected. The concentration of the prions in the soil is uncertain, and concentration is not directly proportional to infectivity. Factors affecting prion infectivity in the soil have been shown to include the length of time in the soil and the binding abilities of the soil. For a detailed risk assessment of scrapie-contaminated soil, it was of major importance to analyze whether the detectable PrPSc in the soil extracts still exhibited oral infectivity after incubation times up to 29 months. A bioassay with Syrian hamsters was performed by feeding the animals with contaminated soil or aqueous soil extracts that had been collected after soil incubation for 26 and 29 months, respectively. Hamsters fed with contaminated soil exhibited their first scrapie-associated symptoms at two weeks to six months (95% CI) after the first feeding. The hamsters reached the terminal stage of scrapie at five to 21 months (95% CI) after the first feeding. This indicated substantial amounts of persistent infectivity in soil that had been incubated for 26 and 29 months. In Iceland in 1978, a program was implemented to eradicate scrapie, and affected flocks were culled, premises were disinfected, and sheep houses were burnt; after two to three years, the premises were restocked with lambs from scrapie-free areas. Between 1978 and 2004, scrapie recurred on 33 farms. Nine recurrences occurred 14–21 years after culling as a result of persistent environmental contamination with PrPSc. The binding abilities of different soil types have been shown to enhance disease penetrance into a population. Soil containing the common clay mineral montmorillonite (Mte) and kaolinite (Kte) binds more effectively with the prions than soil containing quartz. Enhanced transmissibility of soil-bound prions may explain the environmental spread of scrapie despite low levels shed into the environment. The mechanism by which Mte or other soil components enhances the transmissibility of particle bound prions remains to be clarified. Prion binding to Mte or other soil components may partially protect PrPSC from denaturation or proteolysis in the digestive tract, allowing more disease agent to be taken up from the gut. Adsorption of PrPSc soil may alter the aggregation state of the protein, shifting the size distribution toward more infectious prion protein particles, thereby increasing the infectious units. For prion disease to be transmitted via ingestion of prion contaminated soil, prions must also remain infectious by the oral route of exposure. Researchers at the University of Wisconsin investigated the oral infectivity of Mte-bound and soil-bound prions. The effects of prion source (via infected brain homogenate and purified PrPSc) and dose on penetrance (proportion of animals eventually exhibiting clinical signs of scrapie) and incubation period (time to onset of clinical symptoms) was evaluated. About 38% of animals receiving orally 200 ng of unbound, clarified PrPSc derived from soil exhibited clinical symptoms, with an incubation period for infected animals of 203 to 633 days. All animals orally dosed with an equivalent amount of Mte-bound PrPSc manifested disease symptoms in 195 to 637 days. By contrast, animals orally receiving Mte soil alone or one-tenth as much unbound clarified PrPSc (20 ng) remained asymptomatic throughout the course of the experiment. These data established that Mte-bound prions remain infectious via the oral route of exposure, and that the binding agent Mte increases disease penetrance, enhancing the efficiency of oral transmission. "With scrapie, the archetypical TSE, which is a natural disease in sheep and goats, the disease can appear suddenly in a flock in the absence of any known exposure to infected flocks (Palsson, 1979). Finally, fields in Iceland, that were left empty for up to 3 years after the destruction of scrapie-infected flocks, were repopulated with known scrapie-free sheep, and some of the sheep in this latter group subsequently developed scrapie (Palsson, 1979). This last 'experiment in nature' has yielded similar results a number of times in Iceland and in the United Kingdom. In one Icelandic farm, flocks have been eradicated three times; each time, the farm was left without sheep for 2 years, and after restocking with sheep from scrapie-free areas, the disease reappeared. Several years ago, a suggestion was made (S Sigurdarson, personal communication) that hay mites would be a good candidate as a vector for scrapie; this led to infection of mice with mite samples prepared from hay obtained from five Icelandic farms. Ten of these 71 mice became sick after injection with mite preparations from three of the five farms (Wisniewski et al, 1996; Rubenstein et al, 1998). The incubation periods ranged from 340 days to 626 days, and these mice had the protease-resistant form PrpSc, of a host-coded glycoprotein, PrPc . The protease-resistant form is a marker of TSE disease (Prusiner, 1991; Parchi et al, 1996). For some of these clinically positive mice, the banding pattern on WB analysis was unique (Wisniewski et al, 1996; Rubenstein et al, 1998)." Prions (PrPSc) are shed from sheep and goats in birth fluids, feces and other excrement. The concentration of the prions is uncertain, but is not directly proportional to infectivity. Sheep ingest a considerable amount of soil, so soil represents a plausible environmental reservoir of scrapie prions, which can persist in the environment for years. Longevity of the prions and the attachment of soil particles likely influences the persistence and infectivity of prions in the environment. Effective methods of inactivating prions in the soil are currently lacking, and the effects of natural degradation mechanisms on prion infectivity are largely unknown. An improved understanding of the processes affecting the mobility, persistence and bioavailability of prions in soil is needed for the management of prion-contaminated environments. A system for estimating the prion-binding capacity of soil on farms using simple soil analysis may allow an estimate of the prion risk in the environment, and whether altering prion binding by the use of soil amendments may help to mitigate the infectious prions. Lichens, specifically, Parmelia sulcata, Cladonia rangiferina and Lobaria pulmonaria, may have potential for reducing the number of prions because some lichen species contain proteases that show promise in breaking down the prion. Further work to clone and characterize the proteases, assess their effects on prion infectivity, and determine which component organism or organisms present in lichens produce or influence the protease activity is warranted and is currently under investigation. The prion gene that codes for the prion protein is highly conserved in most mammals, meaning the gene is similar and present in most species of mammals. Three locations on the prion protein gene have been identified as highly polymorphic and may have an effect on scrapie: codons 136, 154, and 171. Codon 154 has not shown any evidence of having a high effect on scrapie susceptibility, but is most likely having an effect on incubation time of the disease. Codons 136 and 171 are thought to control the incubation time as well as the susceptibility of the disease, and are the ones the USDA uses in its breeding standard. Codon 171 has been determined to be the major genetic factor in scrapie susceptibility. ^ Detwiler LA (1992). "Scrapie". Rev. - Off. Int. Epizoot. 11 (2): 491–537. PMID 1617202. ^ Hunter N (2007). "Scrapie: uncertainties, biology and molecular approaches". Biochim. Biophys. Acta. 1772 (6): 619–28. doi:10.1016/j.bbadis.2007.04.007. PMID 17560089. ^ "Safety & Availability (Biologics) - Bovine Spongiform Encephalopathy (BSE) Questions and Answers". ^ National Scrapie Education Initiative. "Scrapie Fact Sheet". National Institute for Animal Agriculture. Retrieved 4 December 2011. ^ Rolf, George. "From Sheep to Humans: Scrapie and Creutzfeldt–Jakob Disease". Ecclectica. Archived from the original on 27 August 2011. Retrieved 4 December 2011. ^ Foster JD, Parnham D, Chong A, Goldmann W, Hunter N (2001). "Clinical signs, histopathology and genetics of experimental transmission of BSE and natural scrapie to sheep and goats". Vet. Rec. 148 (6): 165–71. doi:10.1136/vr.148.6.165. PMID 11258721. ^ Detwiler LA, Baylis M (2003). "The epidemiology of scrapie" (PDF). Rev. - Off. Int. Epizoot. 22 (1): 121–43. PMID 12793776. ^ Brown P, Cathala F, Raubertas RF, Gajdusek DC, Castaigne P (1987) "The epidemiology of Creutzfeldt–Jakob disease: conclusion of a 15-year investigation in France and review of the world literature". Neurology, 37(6):895–904. ^ Harries JR, Knight R, Will RG, Cousens SN, Smith PG, Mathews WB (1988) "Creutzfeldt–Jakob disease in England and Wales, 1980–1984: a case-control study of potential risk factors". Journal of Neurology Neurosurgery and Psychiatry, 51(9):1113–1119. ^ Kondo K, Kuriowa Y (1982). "A case control study of Creutzfeldt-Jakob disease: association with physical injuries". Annals of Neurology, 11(4):377–381. ^ World Health Organization, 1999. WHO consultation on public health and animal transmissible spongiform encephalopathies: epidemiology, risk and research requirements, with the participation of the Office International des Epizooties. http://www.who.int/csr/resources/publications/bse/WHO_CDS_CSR_APH_2000 Accessed 7 March 2005. http://www.who.int/csr/resources/publications/bse/en/whocdscsraph20002.pdf. ^ a b "National scrapie plan urged". July 10, 2003. ^ "Sheep and Goats Death Loss" (PDF). National Agricultural Statistics Service. 2005-05-06. Retrieved 2019-01-22. ^ "National Scrapie Plan / Ram Genotyping Scheme Review / Benefits Review" (PDF). Department for the Environment, Food and Rural Affairs. December 2006. This article contains quotations from this source, which is available under the Open Government Licence v1.0. © Crown copyright. ^ "USDA APHIS | Scrapie". ^ "Scrapie | sheep disease". ^ Konold Moore; Bellworthy Simmons (2008). "Evidence of scrapie transmission via milk". BMC Veterinary Research. 4: 16. doi:10.1186/1746-6148-4-16. PMC 2390527. PMID 18445253. ^ Van Keulen, L. J; Schreuder, B. E; Vromans, M. E; Langeveld, J. P; Smits, M. A (2000). "Pathogenesis of natural scrapie in sheep". Archives of Virology. Supplementum (16): 57–71. PMID 11214935. ^ a b c d Scrapie reviewed and published by WikiVet, accessed 12 October 2011. ^ O'Rourke KI, Duncan JV, Logan JR, et al. (2002). "Active surveillance for scrapie by third eyelid biopsy and genetic susceptibility testing of flocks of sheep in Wyoming". Clin. Diagn. Lab. Immunol. 9 (5): 966–71. doi:10.1128/CDLI.9.5.966-971.2002. PMC 120069. PMID 12204945. ^ "Letter from Franz FISCHLER, European Commission Directorate-General for Agriculture to The Right Hon Jack Straw MP Secretary of State for Foreign and Commonwealth Affairs regarding State aid N 544/2002 National Scrapie Plan for Great Britain: Phase 1 – Genotyping schemes to encourage breeding for genetic resistance" (PDF). ^ Heim D, Kihm U (2003). "Risk management of transmissible spongiform encephalopathies in Europe". Rev. - Off. Int. Epizoot. 22 (1): 179–99. PMID 12793779. ^ Richard Rubenstein; Binggong Chang; Perry Gray; Martin Piltch; Marie S. Bulgin; Sharon Sorensen-Melson; Michael W. Miller. "SOFIA: An Assay Platform for Ultrasensitive Detection of PrPSc in Brain and Blood" (PDF). SUNY Downstate Medical Center. Archived from the original (PDF) on 2012-02-05. Retrieved 2011-08-19. "SOFIA: An Assay Platform for Ultrasensitive Detection of PrPSc in Brain and Blood". Prion. 5: 138–139. April 2011 – via Ovid. ^ Saunders, Samuel E.; Shannon L. Bartelt-Hunt; Jason C. Bartz (2008). "Prions in the environment". Prion. 2 (4): 162–169. doi:10.4161/pri.2.4.7951. ^ a b Seidel, Bjoern; Thomzig A; Buschmann A; Groschup M; Peters R; Beekes M; Terytze K (9 May 2007). "Scrapie Agent (Strain 263K) Can Transmit Disease via the Oral Route after Persistence in Soil Over Years". PLOS One. 2 (5): e435. doi:10.1371/journal.pone.0000435. PMC 1855989. PMID 17502917. ^ Terry, Linda; et al. (18 May 2011). "Detection of Prions in the faeces of sheep naturally infected with classical scrapie". Veterinary Research. 42 (65): 65. doi:10.1186/1297-9716-42-65. PMC 3112104. PMID 21592355. ^ Kim, Kiheung (2006-11-22). The Social Construction of Disease: From Scrapie to Prion. Routledge. ISBN 9781134237135. ^ "Scrapie - an overview | ScienceDirect Topics". www.sciencedirect.com. Retrieved 2018-04-13. ^ DETWILER, L.A. "Scrapie (USDA publication)" (PDF). ^ "Scrapie: Scrapie transmission via vaccine - Shorts at The Medical Dictionary". the-medical-dictionary.com. Retrieved 2018-04-13. ^ Caramelli, M.; Ru, G.; Casalone, C.; Bozzetta, E.; Acutis, P. L.; Calella, A.; Forloni, G. (2001-04-28). "Evidence for the transmission of scrapie to sheep and goats from a vaccine against Mycoplasma agalactiae". The Veterinary Record. 148 (17): 531–536. ISSN 0042-4900. PMID 11354646. ^ Zanusso, Gianluigi; Casalone, Cristina; Acutis, Pierluigi; Bozzetta, Elena; Farinazzo, Alessia; Gelati, Matteo; Fiorini, Michele; Forloni, Gianluigi; Sy, Man Sun (April 2003). "Molecular analysis of iatrogenic scrapie in Italy". The Journal of General Virology. 84 (Pt 4): 1047–1052. doi:10.1099/vir.0.18774-0. ISSN 0022-1317. PMID 12655108. ^ Agrimi, U.; Ru, G.; Cardone, F.; Pocchiari, M.; Caramelli, M. (1999-02-13). "Epidemic of transmissible spongiform encephalopathy in sheep and goats in Italy". Lancet. 353 (9152): 560–561. doi:10.1016/S0140-6736(98)04545-0. ISSN 0140-6736. PMID 10028993. ^ McGrath, D; et al. (1982). "Soil Ingestion by Grazing Sheep". Irish Journal of Agriculture. ^ Georgsson, Gudmundu; et al. (2006). "Infectious agent of sheep scrapie may persist in the environment for at least 16 years". Journal of General Virology. 87 (12): 3737–3740. doi:10.1099/vir.0.82011-0. PMID 17098992. ^ Pederson, Joel; et al. (July 2007). "Oral transmissibility of prion disease is enhanced by binding to soil particles". PLOS Pathog. 3 (7): e93. doi:10.1371/journal.ppat.0030093. PMC 1904474. PMID 17616973. ^ Carp, Richard I.; Meekerl, Harry C.; Rubenstein, Richard; Sigurdarson, Sigurdur; Papini, Michael; Kascsak, Richard J.; Kozlowski, Piotr B.; Wisniewski, Henryk M. (January 2000). "Characteristics of scrapie isolates derived from hay mites". Journal of Neurovirology. 6 (2): 137–144. doi:10.3109/13550280009013157. PMID 10822327. ^ Johnson, CJ; et al. (2011). "Degradation of the disease-associated prion protein by a serine protease from lichens". PLOS One. 6 (5): e19836. doi:10.1371/journal.pone.0019836. PMC 3092769. PMID 21589935. ^ Laplanche, J.L. ; Chatelain, J.; Westaway, D.; Thomas, S.; Dussaucy, M.; Brugere-Picoux, J.; Launay, J.M. (January 1993). "PrP Polymorphisms Associated with Natural Scrapie Discovered by Denaturing Gradient Gel Electrophoresis". Genomics. 15 (1): 30–37. doi:10.1006/geno.1993.1006. ISSN 0888-7543. ^ Goldmann, W.; Hunter, N.; Foster, J. D.; Salbaum, J. M.; Beyreuther, K.; Hope, J. (1990-04-01). "Two alleles of a neural protein gene linked to scrapie in sheep". Proceedings of the National Academy of Sciences. 87 (7): 2476–2480. doi:10.1073/pnas.87.7.2476. ISSN 0027-8424. ^ Goldmann, Wilfred; Hunter, Nora; Benson, Grace; Foster, James D.; Hope, James (1991). "Different scrapie-associated fibril proteins (PrP) are encoded by lines of sheep selected for different alleles of the Sip gene". Journal of General Virology. 72 (10): 2411–2417. doi:10.1099/0022-1317-72-10-2411. ^ "Scrapie Eradication Uniform Methods and Rules" (PDF). ^ Clouscard, C.; Beaudry, P.; Elsen, J. M.; Milan, D.; Dussaucy, M.; Bounneau, C.; Schelcher, F.; Chatelain, J.; Launay, J. M. (1995). "Different allelic effects of the codons 136 and 171 of the prion protein gene in sheep with natural scrapie". Journal of General Virology. 76 (8): 2097–2101. doi:10.1099/0022-1317-76-8-2097. ^ Westaway, D.; Zuliani, V.; Cooper, C. M.; Costa, M. Da; Neuman, S.; Jenny, A. L.; Detwiler, L.; Prusiner, S. B. (1994-04-15). "Homozygosity for prion protein alleles encoding glutamine-171 renders sheep susceptible to natural scrapie". Genes & Development. 8 (8): 959–969. doi:10.1101/gad.8.8.959. ISSN 0890-9369. PMID 7926780. Wikimedia Commons has media related to Scrapie. This page was last edited on 17 April 2019, at 01:20 (UTC).